Virginia Burt Designs is pleased to announce we are the recipients of an Honor Award from the Ohio Chapter of the American Society of Landscape Architects (OCASLA). The award was presented on the evening of Friday September 29th at the OCASLA GALA + Awards Ceremony. The Honor Award was for our residential project, Contemporary Sculpture Garden. Highlighting dramatic views over forested hillsides to the city beyond, this garden provides a serene and livable gallery for an extensive and diverse collection of sculpture. 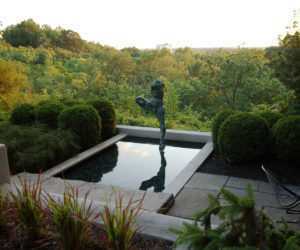 The reflecting pool, visible from all sections of the home, serves as a modernist focal point, and occasionally as a wading pool for grandchildren. Layered four-season plantings and a strong connection between indoors and out ensure that the garden is appreciated year around. Each year the Ohio Chapter of ASLA honors the best in landscape architecture from around the state. The Awards Program brings to the public awareness the outstanding projects and services of Landscape Architects and honours those individuals and firms with professional awards. Entries are juried by a diverse group of professionals that are selected each year including: landscape architects, architects, planners, city officials, academics and directors of non-profit organizations focused on rebuilding the public realm. About Virginia Burt, FCSLA, FASLA, creates landscapes and gardens of meaning for residential clients, healthcare facilities, and academic and governmental organizations. Virginia graduated with honours from University of Guelph in 1985 and worked in offices in Aspen, Colorado and Toronto, Ontario before founding Virginia Burt Designs in 1996. Virginia’s love of the land, the inspiration for her work, began early in her life. Growing up on an apple farm Virginia developed a passion for being outside and understanding the rhythms of nature. For more than 30 years, Virginia’s design philosophy has reflected these roots, enabling her to create gardens and landscapes that reveal their natural context and sensitively reflect and support those who use them. 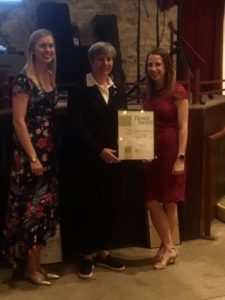 Virginia is one of 7 women in the world designated as a fellow in both ASLA and CSLA.